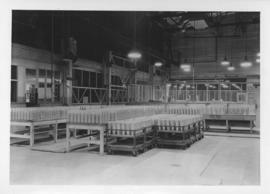 Photograph shows interior view of Dominion Bridge Company during World War 2 munitions retooling, shell cases on workbenches and carts in shot. Date of photograph is approximate, ca. 1940. Photograph shows Hurtig Furs store on Portage Avenue, storefront decorated with victory sign for Victory in Europe (VE Day) celebrations that marked the end of World War 2 in Europe.